S’mores. EVERYONE in my family really, REALLY likes S’mores! Though LIKE perhaps, is much too small a word. Love is a more accurate description. Or single minded obsession even. Since we’re being so honest about it. And over Thanksgiving weekend, ALL they talked about was wanting S’mores. S’more. S’mores. S’mores. Even after I had slaved away creating an 8 inch Lemon Vanilla Cake for them, which also happens to be another of their favorite flavors. Pft! Lemon! So to appease this single-minded Family obsessive, I quite literally steam rolled into this new recipe. One that didn’t quite go as planned the first time around. Because, yes, my friends, there IS such a thing as TOO many marshmallows. Trust me. There is. So don’t do it. Just. Don’t. However, coming up with a S’mores recipe even better than my previous S’mores Cookie Sliders, was no small feat. My Family expects perfection and perfection they shall have! Okay, okay, this perfection snobbery is all mine, not theirs. Not theirs in the slightest. Just another beautiful, unique thing about my Family. We’re more about Love and Togetherness verses expectation and perfection. Because perfection, as the saying goes, is boring. Anyhow, I’m assuming, at this point, that you’d really, REALLY just like this recipe. And so it shall be. Preheat the oven to 350F. Lightly butter or spray an 8×8 inch baking pan. Dust with flour, tapping out the excess. By handheld or stand mixer, blend the butter and brown sugar together for a few minutes. Beat in the egg and then the vanilla. Beat until smooth. Add in the salt and then the flour, until just incorporated. Pour into the pan, using a spatula to gently press the batter into the pan’s edges. Set your timer for 20 minutes. Pop the Blondie batter into the oven and bake for 10 minutes. 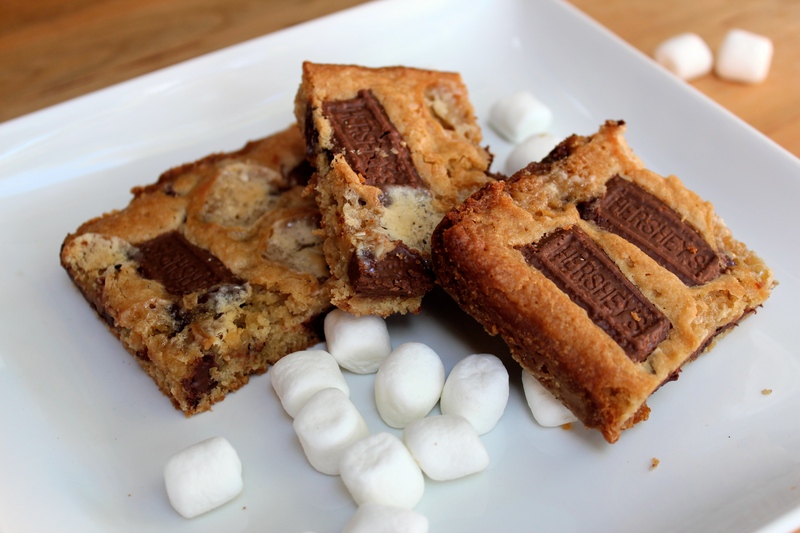 While you’re waiting for the Blondie bottom to half bake, prep the two ingredients needed for the S’mores Topping. Halfway through baking, at 10 minutes in the oven, pause your 20 minute timer and remove the half set Blondie batter from the oven. Lay out each broken Hershey chocolate piece on top of the Blondie, in whatever pattern you’d like, followed by gently pressing the mini marshmallows in between whatever spaces are available between the chocolate pieces. Once you’re happy with laying on that S’mores topping, pop the pan back into oven. restart the timer and let bake for the remaining 10 minutes. Remove from the oven and let cool throughly in the pan, on a cookie sheet, before cutting up into 12 bars. Store airtight, for up to 3 days. So what do you think? This S’mores Blondie might not be the prettiest but as long as it tastes yummy then that’s all that really matters, right? « Happiness Project#46: Classic Peanut Butter Cookies!